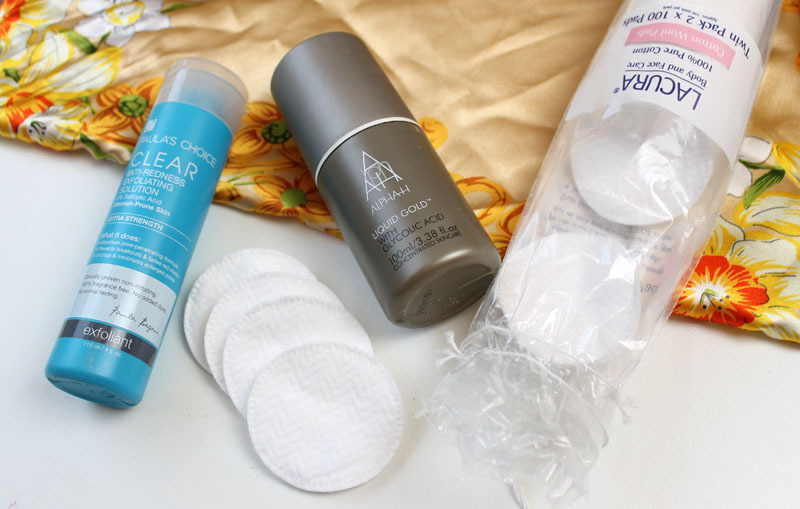 My skincare routine has been pretty stable lately and I haven’t done a post on it since way back when so I thought I’d give you all a rundown of the skincare heroes in my bathroom. I feel like I’ve pretty much got it nailed now and whilst a few new items might creep in now and again, these are pretty much the staples on my shelf. 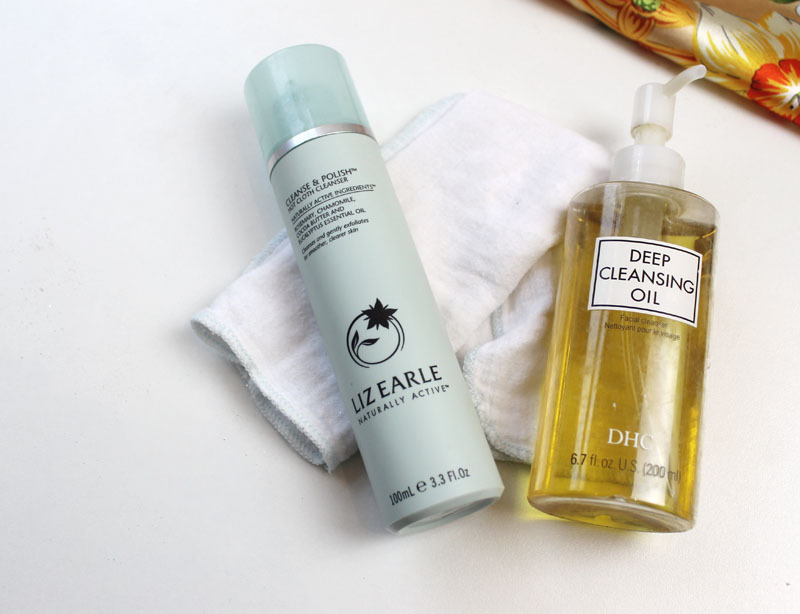 The first step in any routine is cleansing and there’s two products I mainly rely on – DHC Deep Cleansing Oil and Liz Earle Cleanse and Polish Hot Cloth Cleanser. The DHC Cleansing Oil is such a good cleansing oil. It’s unfragranced, doesn’t irritate the skin and clears away makeup without leaving a film or residue on the skin. There’s always hype around Liz Earle and how much of a cult product it is but I honestly honestly LOVE this cleanser. I’ve tried others but I always come back to it. It’s creamy, doesn’t sting your eyes and my skin feels clean after without feeling dry, tight or red. Using the two together make for a really deep clean before bed and I just the hot cloth cleanser in the morning. I don’t tend to use a manual exfoliant as I find I get the exfoliation from my muslin cloth when cleansing but also I’ve not really found a scrub I really like. However I’m a massive fan of chemical exfoliants. My two absolute favourites are the Alpha H Liquid Gold and Paula’s Choice Clear Extra Strength 2% BHA Exfoliant. Both do slightly different jobs – The Alpha H Liquid Gold is an AHA and Paula’s Choice is a BHA. Breaking it down into simple terms, AHAs work on skin’s surface, and are water soluble. BHA are oil soluble and work on the skin’s surface and inside the pores. I find the Liquid Gold is more a general purpose and Paula’s Choice is incredible at removing and preventing any pesky blocked pores and spots around my chin and jaw area. 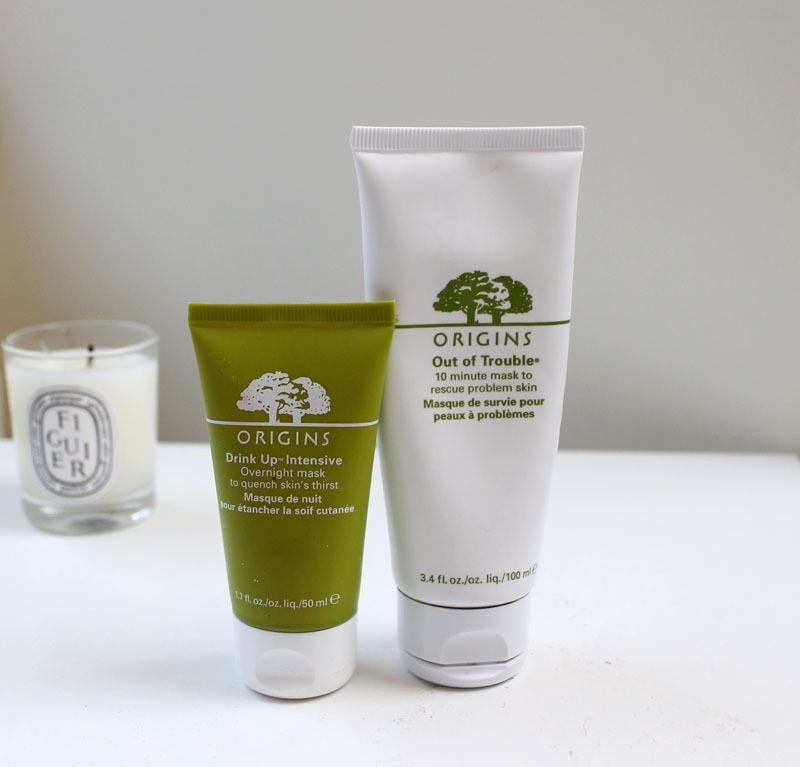 Having quite sensitive skin I have to be careful when it comes to face masks having used a fair few that made my skin look like I’d spent too long on a sunbed.However I’m just going to come right out and say I love Origins. My favourite two masks are the Out of Trouble 10 Minute mask which is so good when I’m breaking out, and the Drink Up Intensive Overnight Mask. It’s hard to think that even though my skin is quite oily, it can dry especially around my nose and cheeks so I find this gives me a hydration boost once or twice a week. It’s so good I even have a travel version as well as the full size. As I mentioned previously despite my skin being quite oily it can get quite dry. 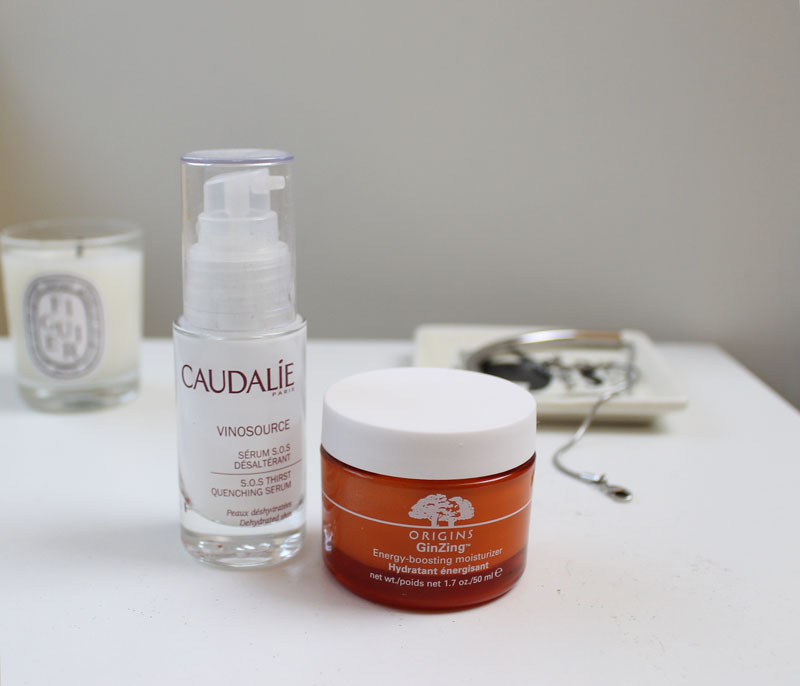 I love the Caudalie SOS Thirst Quenching Serum which I’ve been using for quite a few years now. I love how light it is and is easily absorbed so it’s great to use under my makeup in the morning. I stumbled upon the Origins Ginzing Energy Boosting Moisturiser but I was so taken with it it’s now a skincare staple. Like the Caudalie serum it’s lovely and lightweight and easily absorbed so I’m not sitting around waiting for it to sink in. Also it smells heavenly and it might be purely psychological but it really does feel like it refreshes you when you’re a bit tired in the morning. What are your skincare staples? Do you have any you would recommend? The Liz Earle Hot Cloth Cleanser is a staple for me in my skincare routine, as is the Origins Ginzing Moisturiser – it smells heavenly!